Someone unexpectedly took this photo with my camera. Thank you for capturing a moment that demonstrates why we all had such a great time at Flamboro Downs. In addition to the fantastic entertainment provided by ETAs, we were encouraged to dance, mingle, and participate. Photo Credit: ? Cathy and Marian, both TiCat fans, were at a game before coming to Elements/Flamboro. Photo Credit: Carolyn MacArthur. It was a great night for two ETA fans on Friday, June 29th, 2018. Before coming to see Anthony Vons’s fabulous show, Cathy and Marian were at the Hamilton Tiger-Cats football game witnessing the Cats’ 31 to 17 win over the Winnipeg Blue Bombers. Dot Farr poses with ETA Anthony Von for her annual calendar photo. Photo Credit: Carolyn MacArthur. Dot Farr, friend and ETA fan, lent me two of her very special videos to watch. “Summer of ’56” is a documentary of Elvis’s love affair with June Juanico. It contains rare 8mm footage of Elvis on a fishing boat with June, his parents, and his entourage that was filmed by June’s mother’s boyfriend. 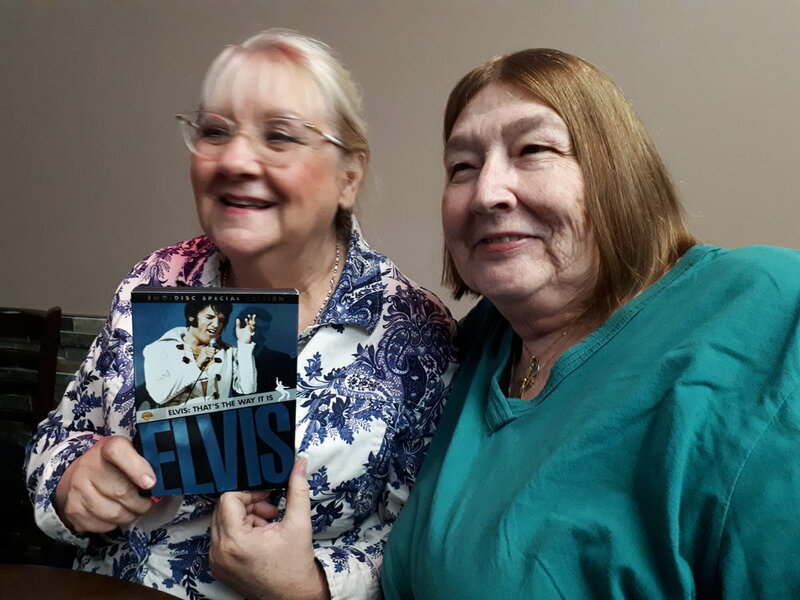 I also have another one of Dot’s cherished videos on loan, “Elvis: That’s The Way It Is”, which I am looking forward to watching. I am so grateful that the ETA shows have brought some wonderful people into my life. The end of the shows at Elements/Flamboro means I may not see Barb, Linda, Dot, Laura, Debbie, Sandy, Sandra, Cathy, Marian, Frances, Joan, Irene, Deb, Pat, and many, many more ETA fans, as often, but thanks to the internet, we will keep in touch. There will be private shows where we will surely meet up; and, of course there are the Elvis competitions: Niagara Falls, Collingwood, Tweed, and Flaming Star. But Flamboro Downs had its own special energy. Perhaps the low stage, bar seating, little fireplace, and comfy chairs added to the friendly atmosphere that encouraged ETAs to get close to their audiences, literally and figuratively. Whatever the reason, we experienced some of the best ever ETA performances at Flamboro Downs. I wish thank Sandra Gold for booking many of the ETA shows we saw at Flamboro and Mohawk Casinos. And to the fantastic ETAs who gave stellar performances, and who spent time during and after their shows at Elements/Flamboro talking with fans and taking numerous photos, thank you, thank you, thank you! You are all amazing individuals who pay a wonderful tribute to Elvis with every performance. Best regards, Carolyn. Top Row: Matt Cage, Anthony Von, Mike Calamusa, James Gibb, Bruno Nesci. Bottom Row: Kevin Mills, Sylvain Leduc, Bruce Stewart, Brent Freeman, Gino Monopoli (photo from Brantford Casino). I wish to thank Irene Lobsinger's friend, Pat, for sending along these great photos.